Stage of 19th century dance. Quadrille, Waltz, Polka, Mazurka and Scottish country dances. 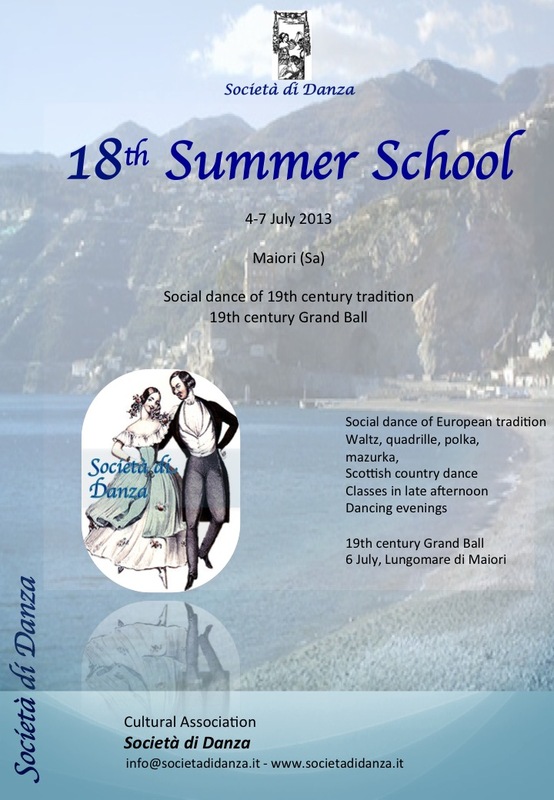 The traditional Summer School of Società di Danza will be held this year in Maiori (Salerno), on the Amalfi coast. We will study 19th century social dance recontructed on the basis of 19th century ball maual. Dance program includes waltz, quadrille, polka, mazurka and Scottish Country Dance. The classes will be divided into levels. Three days of dance and holiday at the beautiful sea of the Amalfi coast. Classes and seminars will be held il the late afternoon on Friday 5th and Saturday 6th, and in the mornigo of Sunday 7th. Grand Ball in Maiori on Saturday 6th July. We stay at the Hotel Pietra di Luna.